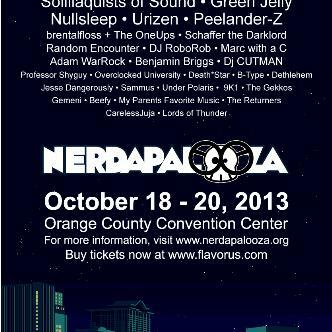 Nerdapalooza is an annual nerd culture arts and music festival, the first of its kind to invite all genres of the nerd music movement under one roof, including nerd rock, nerdcore hip hop, chiptunes, and video game music. This year's Nerdapalooza will also have a full nerdy-themed art gallery, a large vendor room with an artist alley, and plenty of fun things to do throughout the event. This year's Nerdapalooza will take place in the Orange County Convention Center in Orlando, FL on October 18th through the 20th. 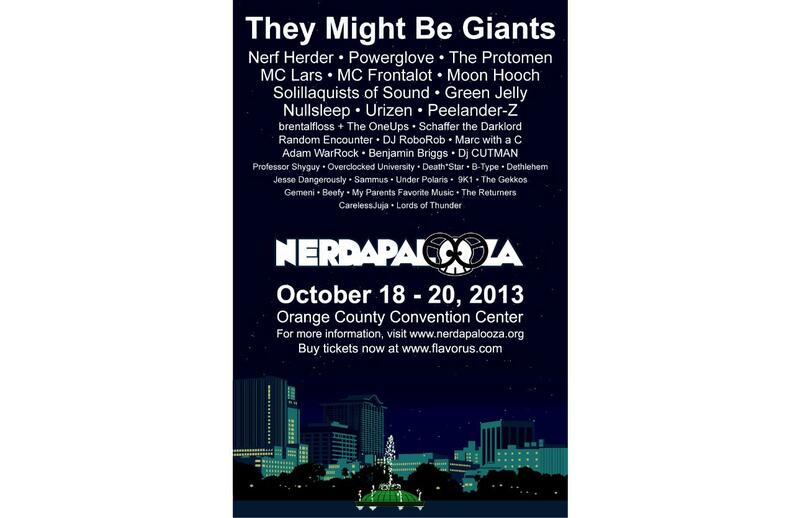 They Might Be Giants, Nerf Herder, Powerglove, The Protomen, MC Lars, MC Frontalot, Moon Hooch, Solillaquists of Sound, Green Jelly, Nullsleep, Urizen, Peelander-Z, brentalfloss + The OneUps, Schaffer the Darklord, Adam WarRock, Random Encounter, DJ RoboRob, Marc with a C, Benjamin Briggs, Dj CUTMAN, Professor Shyguy, Overclocked University, Death*Star, B-Type, Dethlehem, Jesse Dangerously, Sammus, Under Polaris, 9K1, The Gekkos, Gemeni, Beefy, My Parents Favorite Music, The Returners, Lords of Thunder, CarelessJuja AND EVEN MORE TO BE ANNOUNCED!